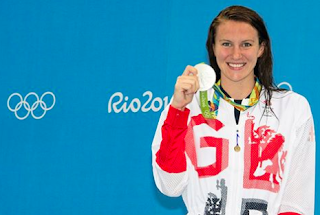 Double Olympic silver medalist Jazz Carlin from Great Britain is training to replicate the 2012 Olympic success of Oussama Mellouli in both pool and open water. The British freestyler is considering racing in the new women's 1500m event and the Olympic 10K Marathon Swim at the 2020 Tokyo Olympics. Carlin recently raced in her first 10 km event against world-class athletes. At the recent FINA/HOSA 10km Marathon Swimming World Cup race held in China's Qiandao Lake on October 15th, she finished 11th. Similar to the 2016 men's 1500m gold medalist Gregorio Paltrinieri of Italy who is also entering the world of open water swimming in the 2020 Olympic quadrennial, 2016 400m and 800m silver medalist Carlin has the speed and stamina to double up in both the pool and open water. "The water in Odaiba Marine Park at the Olympic 10K Marathon Swim at the 2020 Tokyo Olympics will be as flat as a pool without currents or waves or marine life," says Steven Munatones. "These kinds of calm conditions gives the world's fastest swimmers with lesser open water swimming experiences an ideal venue to compete for medals." The race is on - with a whole lot of hard training scheduled.